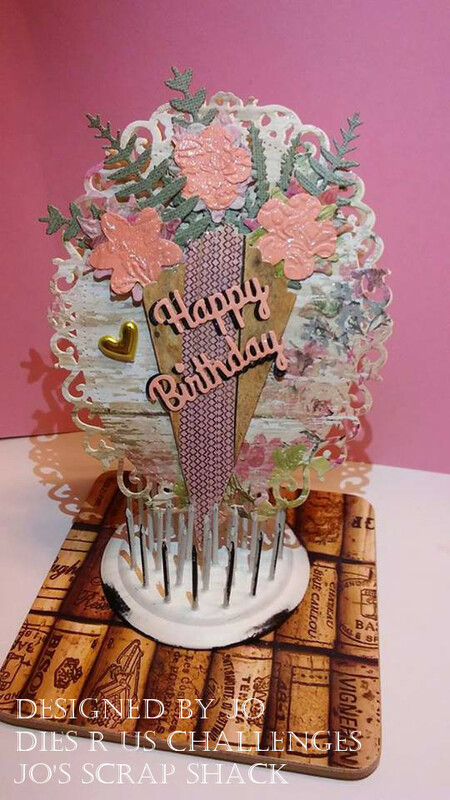 ~Jo's Scrap Shack~: Challenge 83 With Dies R Us! 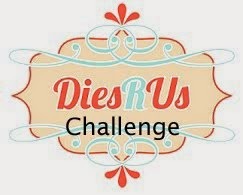 Challenge 83 With Dies R Us! Welcome to our new mid-month challenge at Dies R US! Our challenge today is to use LEAVES. So anything you want to create, any theme, any style... just use some leaves on your project. For my card today, I cut out this really cute "Summer Flowers" background die from Die-Versions onto some bristol paper that I had blended a bit of tea dye and vintage photo distress inks on. I adhered this panel to a white piece of cardstock. I took an entire piece of bristol paper and in different sections, used various distress and oxide inks to blend the colors I needed for my project. I cut out some Memory Box- Citrus Leaves Dies and some Lawn Fawn- Stitched Leaves Dies that were blended with mowed lawn and peeled paint. I also cut out the pretty tall flourish out of the same blended paper. That flourish is also from Die-Versions. Now I knew that I wanted to have sunflowers on this card but I don't own any sunflower dies. So I got my thinking cap on and looked through my dies and found some dies I knew would work! My sunflower was created by using the second largest die in the "Delightful Circle Dies" from Spellbinders and the inside of my sunflower was created by cutting out the smallest circle from the Lawn Fawn- Small Stitched Circle Stackables Dies. 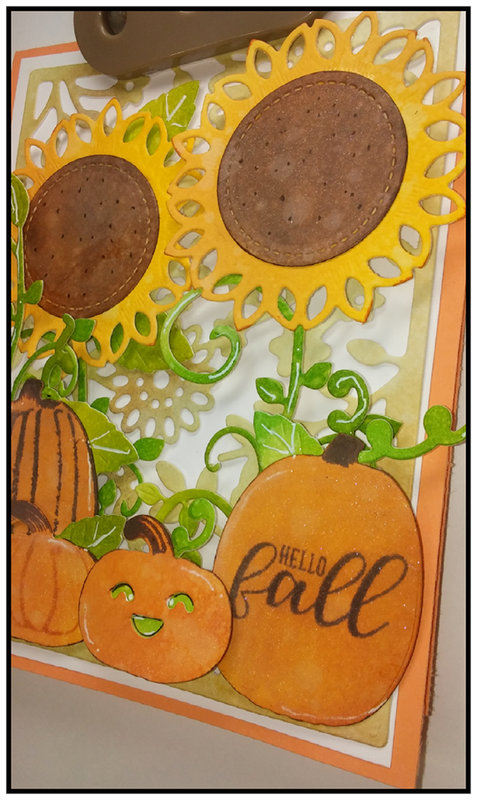 The sunflowers were blended using mustard seed and fossilized amber distress inks and the centers were blended with gathered twigs and walnut stain inks. To each distressed portion, I spritzed some water and dried it for a little texture. And I must say that these made some beautiful sunflowers, especially paired up with the flourish as its stem!! And that completes my card! All of the dies that I used are highlighted in the links above and can be found in the Dies R Us store HERE. 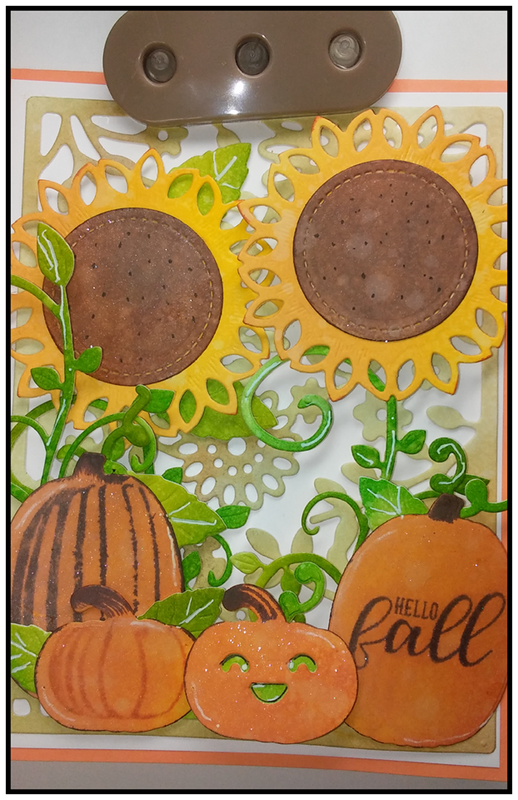 Gorgeous card with the sunflowers and pumpkins!!! 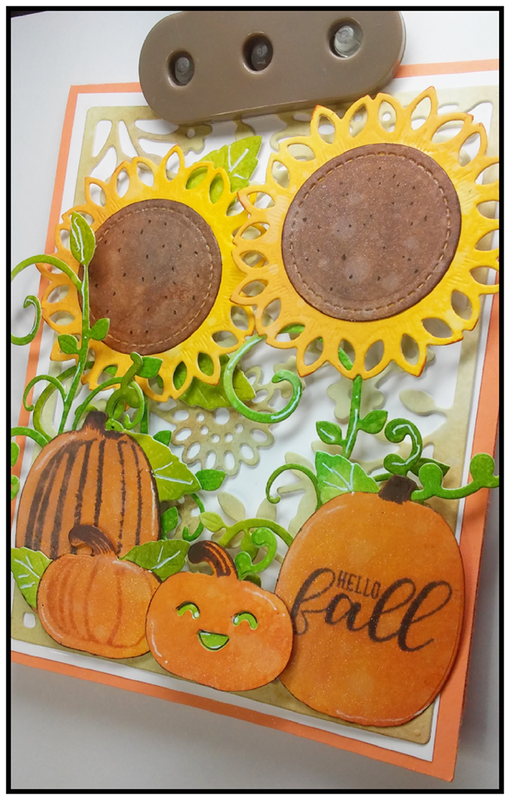 Nothing makes a card scream fall more than sunflowers & pumpkins! Your card is awesome and love the dimension you've added. 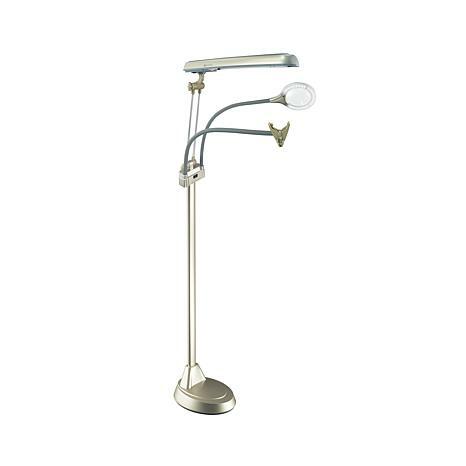 WOW I've never seen a light with the clip attachment ... awesome ... gives good lighting on your creation. Perfect! This is BEAUTIFUL my friend! 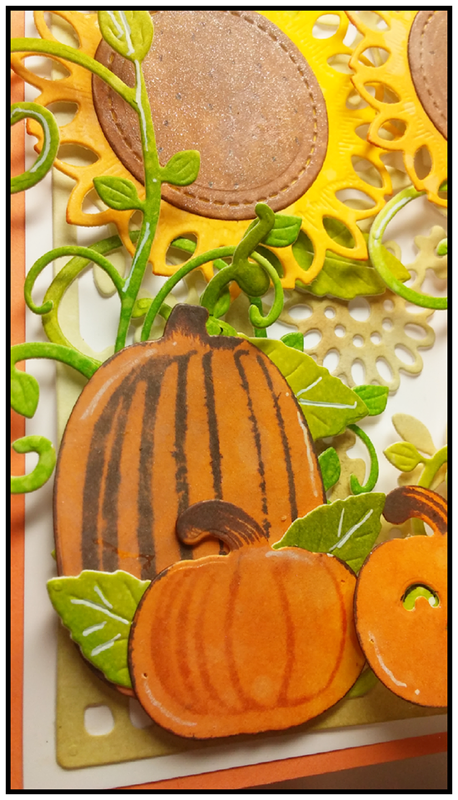 I love the pretty sunflowers and cute pumpkins! Oh my goodness, what a gorgeous card Jo! The sunflowers are beautiful!!! They turned out spectacular~The pumpkins are so sweet and the foliage really pops. Great job on this beauty!